Emerse Fae is the latest player to take advantage of revised Fifa rules on international eligibility and declare himself available for the Ivory Coast. The 21-year-old midfielder plays in the French first division with Nantes and was previously capped by France at under-21 level. He has now declared that his international future lies with the land of his parents despite being touted as a future French star. Fae has told the Elephants coach Henri Michel that he wants to be selected for next month's friendly against the DR Congo in Rouen, France. "It's my heart which has made the decision," Fae said. "I think both France and Ivory Coast have equal chances of going to the 2006 World Cup finals so I'm not just choosing the Ivorians in order to play in Germany next year." "I have spoken to other Ivorian players in France and I think there's a very exciting generation of players that I would like to play with." 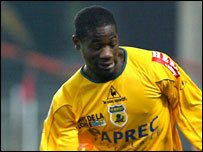 Among the players he consulted was his Nantes team-mate Giles Yapi Yapo, who is a regular member of the Ivory Coast squad. "He gave me advice about the Ivorian team but the choice in the end was mine alone," said Fae, adding that he also received prompting telephone calls from England-based duo Didier Drobga and Kolo Toure. "The choice is clear now. My objective is the next World Cup with the Ivory Coast." The stage is now set for Fare to become the 18th former French junior international to change allegiance to another country in line with new Fifa rules introduced in October 2003. Fae was a member of the French side that won the world under-17 championship in Trinidad and Tobago in 2001. He also scored the winner for France's undet-21 side in their 1-0 win overt Ireland in a European championship qualifier.